The Manu Eco Lodge Tambo Eori is located in the tropical rainforest on the bank of the Alto Madre de Dios River (at an altitude of 470 m/ 1.542 ft). The lodge can only reached by boat and is part of a private protective area of 50 ha/ 124 acres within the Manu Biosphere Reserve. 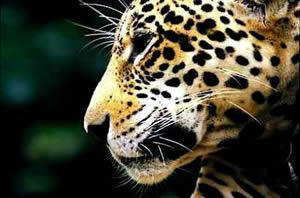 Jungle Trails around the lodge invite to explore the rainforest and to observe wildlife. TAMBO EORI offers rustic bungalows with six twin bedded rooms including roofed terraces, a dining area with terrace, an observation tower, toilets and lavatories and some showers. 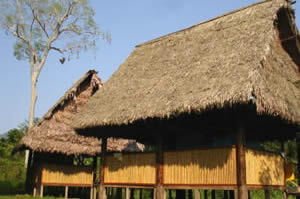 All platforms are thatched with palm leaves and connected by wooden bridges. Inspired by the traditional architectural style of the Manu rainforest and purely built of natural materials, TAMBO EORI melts perfectly with its surroundings, the Manu Lowland Rainforest. Already from your room or the terraces of the lodge you may observe different species of birds like toucans, parrots, macaws, oropendula and motmot, and also a variety of monkeys, reptiles and other mammals. Leaded by our guide you can hike along different trails around the lodge and experience the immense variety of fauna and flora of this unique ecosystem. The lowland jungle is the habitat of a fascinating fauna. Apart from an enormous variety of birds you can find two species of peccaries, capybara, five species of monkeys, river otter, and caiman and of course the jaguar and puma, anteater and slot. As well the Manu Cloud Forest you will also find a colorful diversity of insects.